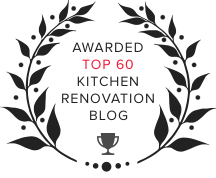 Cabinets are a primary feature in any kitchen remodel. However, the same aesthetic attributes cabinetry adds to a kitchen design - via door panel styles - can actually detract from your kitchen's look and function if you aren't careful. Sometimes, it's best to skip cabinets for certain applications, opting for open shelving instead. When we say "open shelving vs. cabinets with doors," it isn't that one is better than the other. However, there are certain circumstances where open shelving wins out. Extra visual space, recommended for smaller kitchens or for blind corners. Easy access to regularly used mugs, glasses, and dishware. Low-maintenance and easy to keep clean. They provide space to add a little color to the design. In the grand evolution of kitchen design, open shelving options were a standard. Building custom cabinetry by hand is no easy feat, and to purchase custom cabinetry has always been a higher-dollar investment. Thus, open shelving was the most popular storage option for kitchens and pantries until more affordable, mass-produced cabinetry came on the market. Now, open shelving is making a comeback because it keeps things easy, accessible and (if desired) more colorful. The following are circumstances where open shelving may be a better option than cabinets with doors. Cabinets take up about 12- to 24-inches of depth from the wall into you air space. This is pretty significant in a small kitchen. When you eliminate the cabinet box and doors, opting for open shelving instead, you "add" that visual space back, which keeps your kitchen feeling more open and spacious. Whisper-quiet hinges are nice but, apart from the sound of rapid-fire cabinet door shutting, opening and closing cabinetry is more cumbersome than you think. Only those of us who have open shelving are aware of this. Your shelves make it so much simpler to grab your go-to mugs, cups and daily dishware. They also expedite the process of emptying your dishwasher. 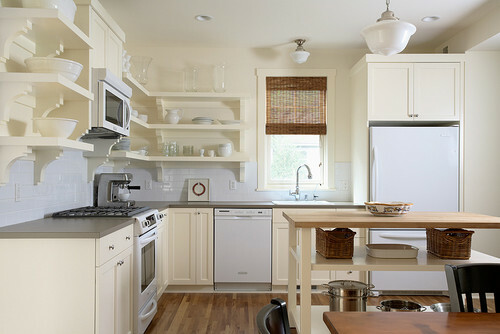 Accessible or livable kitchen designs also capitalize on the ease-of-use offered by open shelving. Elderly people and those with any type of mobility issue find open shelves markedly easier to access than cabinets with doors because they eliminate an extra step or two and keep someone from having to maneuver around cumbersome, open cabinet doors. Well-built cabinetry shouldn't be too difficult to maintain but there are still cabinet doors to keep free of splatter and smudging. There are hinges that can break and cabinet doors hide the cavernous cabinet body that can collect miscellaneous debris without you even knowing it. Shelves, on the other hand, require virtually zero maintenance. Once they are firmly installed, they aren't going anywhere. To clean them, you simply offload the contents, run a damp cloth along the surface, and they're back to clean again. With a nice seal, they won't need to be repainted for years unless you have a change of heart in regards to color. If you opt for commercial-style, stainless steel shelving, you'll hardly need to clean them at all. 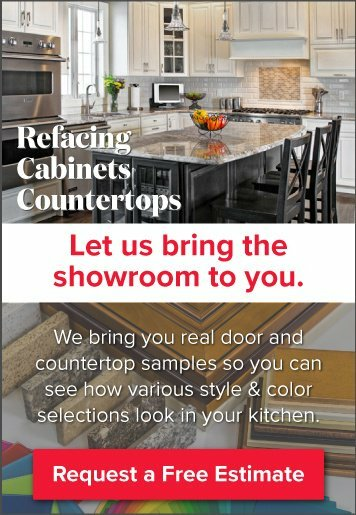 A tenet of timeless design is using a more neutral color palette for "permanent" fixtures - like cabinets and countertops - and then using accessories to add splashes of trendy color. Open shelving installations are a great space to add those transient color infusions. Bring your kitchen plans over to Kitchen Magic and we can help you suss out the best spots for open shelving versus cabinets with doors.